Part 1: Am I a Potential Whistleblower? The label of “whistleblower” has popped up with increasing frequency in recent years, both in the news media and popular culture, as shown by the examples below. Various laws provide rewards to whistleblowers for helping the government recover money when it has been defrauded. 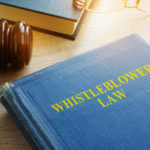 This multi-part series will focus on these two legal aspects of whistleblowing, and will provide a general overview of the area for those who think they may have fraud to uncover. These areas of law are, of course, highly complicated, and this series is not designed to provide legal advice of any kind. If you have questions about your rights, obligations, or potential legal claims, you should contact an attorney, and do so as promptly as possible, as there may be statutes of limitation or other deadlines that could impact your ability to bring a claim. In Part 2 of this series, we will cover some of the legal protections that apply to whistleblowers.